There are many books that claim to help you lose weight, but most consist of some sort of diet plan or food restriction program. 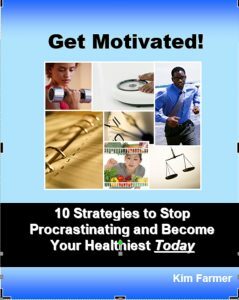 This book shows you how to GET and STAY motivated to achieve your best health without dieting or food group restrictions Full of great tips and strategies, “Get Motivated!” will help you use the right tools to stay on the right track for the best exercise and nutrition plan for yourself. With our exhaustive schedules due to family, work and other obligations, it is no wonder that 58 million Americans are considered overweight and 40 million are considered obese. Take charge of your own health and put an end to the ups and downs of weight gain and loss. Gain valuable insight into how you can finally reach your ideal weight and body fat levels even if you haven’t stayed on track before. This book was written for people that have struggled in the past with their body weight and for people that want to gain more knowledge in the areas of exercise and nutrition. Everyone needs a little push to get them going every now and then. Let an industry professional give you the extra motivation you need to help yourself.